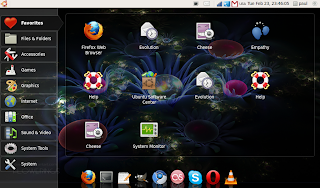 Yes, I've been running Ubuntu Lucid (10.4) on my little EeePC 901 for about a month. Even though it's in alpha (actaully alpha 2), it runs extremely well and I can't remember having even one crash with it. Plus it boots in 40 seconds which is great but still a long way short of Ubuntu's target to get boot time down to 10 seconds by the time Lucid goes main stream which is only two months away. Although I had been regularly, if not daily, updating the install, I was just a little behind schedule on this when I tried it again a couple of days ago. Now I found I couldn't update because there was insufficient / partition space (remember this machine has just 20 GB total of HD space and I have FOUR other OSes installed) for the update. OK, so I thought I'd install the latest daily build iso to make sure I was fully up to date without needing to use Parted Magic to do some judicious rearranging of my partitions. As usual I burned the iso to a usb key using Unetbootin and proceeded to install. However, just after doing the manual partition selection (because I DON'T want to format my precious /home) I got a message about having an invalid username. What username? I never used any username. Seems this is a bug which is discussed in this thread. overcomes this difficulty. Indeed, I have used the same command a few times with previous versions of Ubuntu. So, it seems like it's something to keep in mind for the future. In my case however, I was unaware of this solution and went ahead and enlarged my Ubuntu root partition with Parted Magic. Next, I did a full update which took a little more than two hours and everything seemed to go well. However, when I rebooted into my updated Lucid, I found that my desktop looked much more like the Ubuntu Netbook Remix (which I regretfully do not like) than what I had prior to the update (See the screen shot). No Applications-Places-System was available in the panel, no facility to add stuff to the upper(in my case) panel was available, quite a few things I previously had --most notable the System Monitor -- were no longer available, windows no longer contained the maximize-minimize-close buttons and only a close button was provided for each open window in the panel. Additioally, quite a few apps and utilities were not available in the now permanently displayed Applications drop-down. An example is the Take Sceenshot app which used to be included in Applications>>Accessories. To get the screenshot I show in this post I had to use Fn-PrtSc. No, I really do NOT like this. Now maybe this is due to the fact that I originally downloaded a netbook version of the Lucid iso as I had understood this to make better use of the small netbook screens (mine is 8.9"). But perhaps "netboot" meant you were heading towards the UNR. Nevertheless, Lucid Alpha 3 is out on Thursday so I'll wait until then to do a clean install of the new Alpha and this time I'm going to avaoid any mention of the word "netbook". If you want to see how I get on, keep in touch.